We still have about a month until back to school. How about you? I know my brother's girls start school today…aack…I'm not ready. 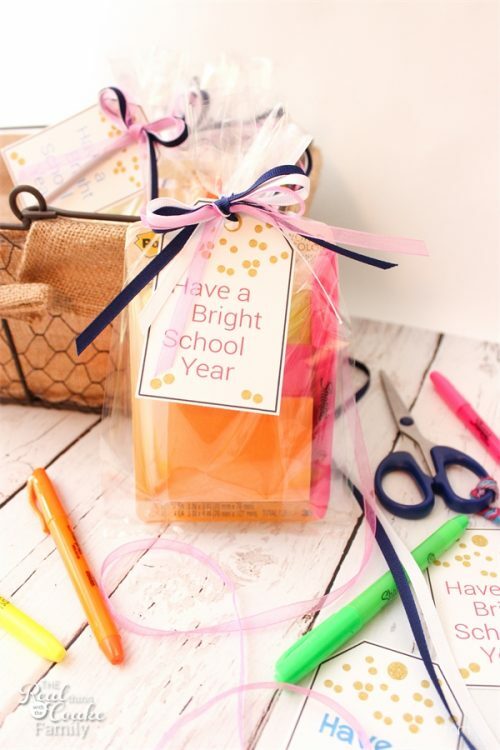 I did, however, get a super simple and inexpensive back to school teacher gift ready before we left on our road trip. One less thing to do when we get home. Yay! Let me be honest for a moment. Last year, I did a horrible job at thanking the teachers in both of my girls lives. This year, I'm vowing to do a better job. 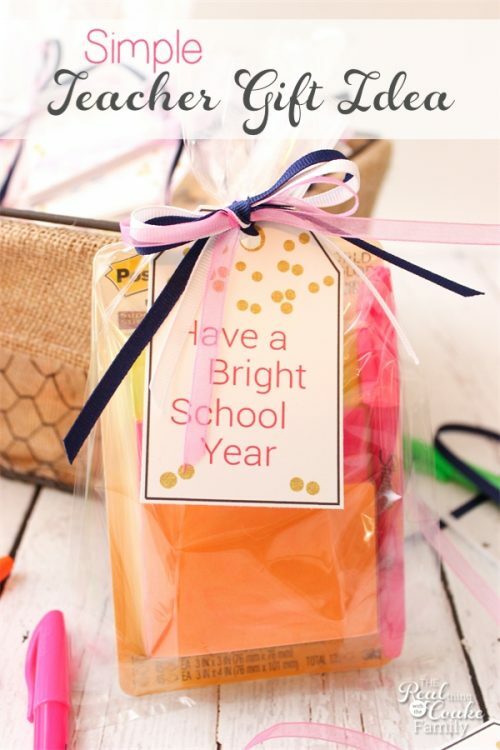 I'm staring with this super simple and inexpensive idea for a back to school teacher gift. I've made plenty of teacher thank you gifts in the past, but now that my oldest daughter is in middle school at our local public school, she has 7 teachers. The costs of giving a gift to each teacher can add up really quickly. My youngest daughter is starting at a new co-op this year and will have 3 or 4 teachers there. Ummm…yeah…not made of money. I decided to come up with something simple, sometimes I think cheesy…but we are going with, “It's the thought that counts,” idea here. 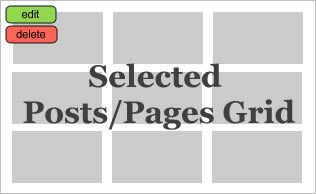 Start by printing and cutting out your gift tags (there is a free printable at the end of this post). Punch a hole in the top of the tag. 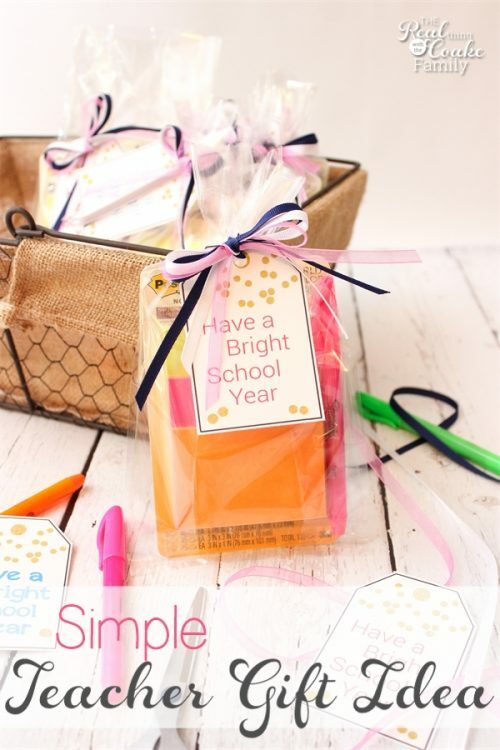 Then just take a simple gift clear gift bag and place in a package of sticky notes and a few highlighters. 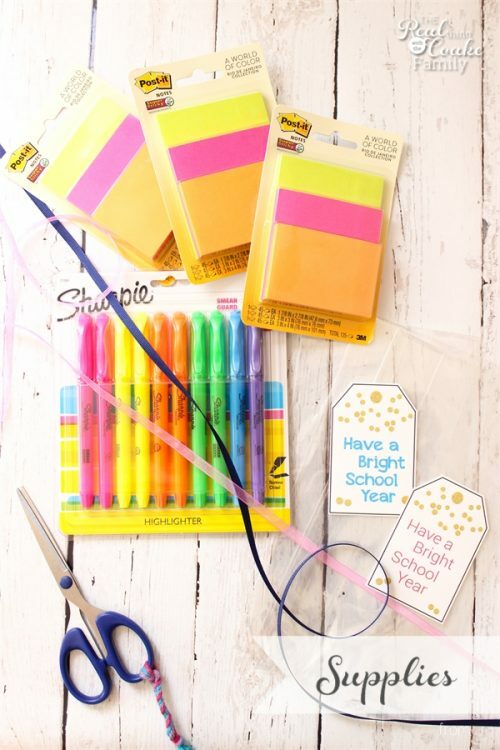 We selected a package of 3 neon sticky notes (affiliate link) along with bright-colored highlighters. Tie on your bow. You are done! See, simple and easy. 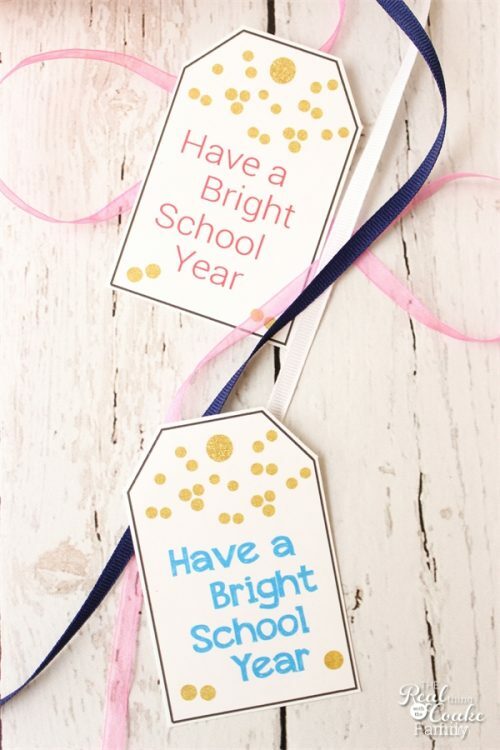 To give your gift a touch of school spirit, use ribbons in your school colors. I made 11 of these (I think) before we left. It was quick and easy and it didn't cost me a fortune. I think both of my girls will enjoy giving them to their teachers. What simple and inexpensive back to school gift ideas do you have? What a wonderful way to kick off the school year! I’m betting the new teachers will really appreciate it! I love how adorable and needed this is! Thanks for sharing the idea with the FrugalMommas team. Already pinned and sharing out to some teacher and momma friends of mine. I love this idea. Thanks for sharing at the #InspirationSpotlight Party. Pinned & shared.